A pilonidal sinus is a small cyst found in the natal cleft, the top part of the buttocks. 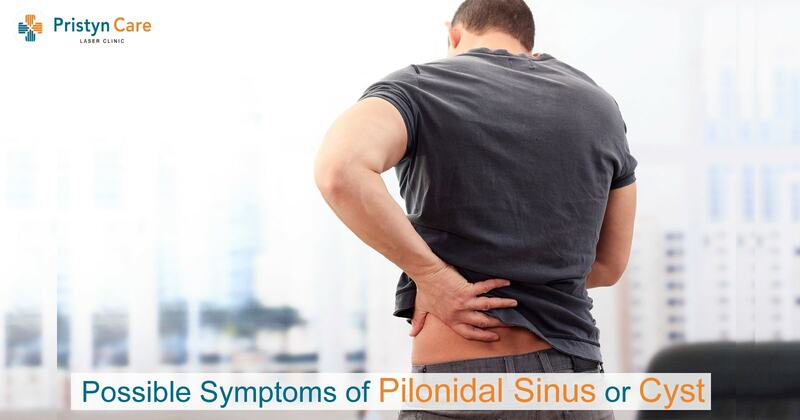 Generally, Pilonidal sinuses don’t cause problems, unless they become inflamed or infected. It causes pain and discomfort and may even impede the ability to stand or sit for a prolonged period. A pilonidal cyst may cause no noticeable symptoms as it is normally painless. It’s often left undiagnosed until it gets infected. The initial sign of a pilonidal cyst is usually characterized by a small dimple-like structure or you may notice a small lump close to the natal cleft. You should consult your doctor immediately to make sure whether it is a pilonidal cyst or any other problem. You may feel pain while sitting or standing. Reddened and sore skin around the depression. The protrusion becomes inflamed and tender to the touch. Drainage of pus or blood from an opening in the skin. Foul smell from draining pus. Hair protruding from the affected area. More sinus tracts over a period of time. Sometimes, low-grade fevers, accompanied by nausea and weakness. But, these symptoms are uncommon. If you find any of these symptoms, consult a healthcare professional to make sure that your pilonidal cyst is properly taken care of and lower your risk of making the infection worse.